Reminder: our survey on attitudes and experiences in peer review is open until September 21st – please fill it in and urge your peers to do so too! 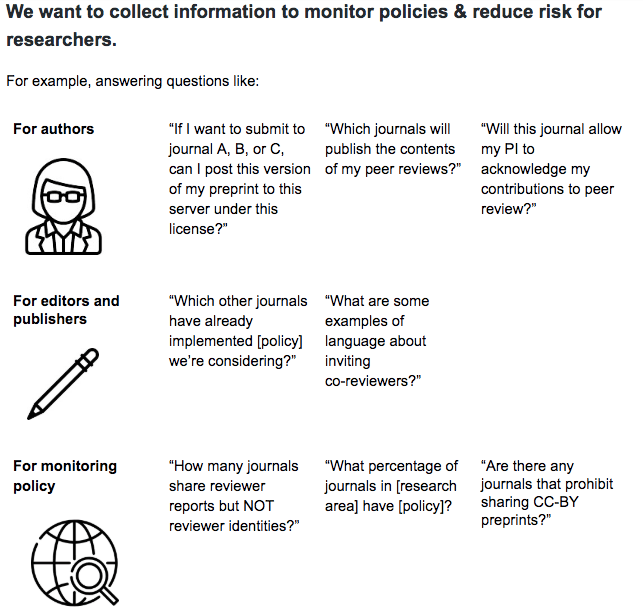 As part of our effort to increase transparency about the role of early career researchers in peer review, we are trying to collect data on the policies that journals have implemented with respect to involvement of early career researchers. Particularly we are looking at how transparent co-reviewer policies are, and whether expectations around co-reviewing are made clear. We are part of a collaborative project, TRANsparency in Scholarly Publishing for Open Scholarship Evolution or TRANSPOSE, to work on gathering this and other data about scholarly publishing. This project has been accepted as part of the Scholarly Communication Institute 2018 Meeting in Chapel Hill, NC, where the theme is “Overcoming Risk“. One of the risks identified in our project is the risk ECRs face when it comes to ensuring their scholarly contribution is recognized. TRANSPOSE (TRANsparency in Scholarly Publishing for Open Scholarship Evolution) is a grassroots project to crowdsource journal policies on peer review and preprints. The project is a collaborative effort across a number of different organizations dedicated to making publishing more transparent. Future of Research is particularly interested in the component you can search below – which journals allow co-reviewers to be named! Journal policies on peer review and preprints are variable and complex. Existing databases (such as SHERPA/RoMEO and Publons) contain some, but not all, of this information. If you’d like to add data (which you can see below and at our #ECRPeerReview resource) please go to the TRANSPOSE website, click on the journal you’d like to update, and enter the information! If you can’t find a journal by searching below, you can add a new record by clicking here. The TRANSPOSE project has been accepted as part of the Scholarly Communication Institute 2018 Meeting in Chapel Hill, NC. This year’s meeting theme is “Overcoming Risk“, and one of the risks identified in our project is the risk ECRs face when it comes to ensuring their scholarly contribution is recognized. 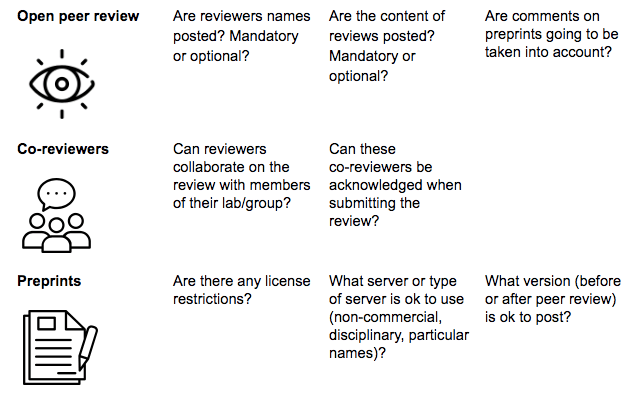 ECRs may feel hesitant to contribute to peer review done in the name of their supervisor; and supervisors may not disclose names of others involved in review where journal policies suggest such common practices may have punitive consequences. Providing appropriate and ethical credit for their involvement would reduce their risk. This working conference, bringing together members of our team from around the world, will be used to improve and expand upon our efforts. The members of the team include Dr. Jessica Polka (ASAPbio), Dr. Jennifer Lin (CrossRef), Dr. Benedikt Fecher (Humboldt Institute for Internet and Society), Dr. Samantha Hindle (bioRxiv), Dr. Tony Ross-Hellauer (Know-Center GmbH) and Dr. Gary McDowell (FoR). Show me the data already! You can click on the link in the final column to update a journal. If you can’t find a journal by searching below, you can add a new record by clicking here. You can also always find this (and more) information at our#ECRPeerReview resource. For the related database on preprint policies, see the resource at ASAPbio here.